Students at Varndean College have been celebrating their A level success. Students took 1,008 individual A level exams, with 48.7 per cent achieving A* to B grades and 75.5 per cent achieving A* to C grades. The sixth form college said that the pass rate was 100 per cent in 19 Alevel subjects. Once again visual arts courses (art, graphic design, 3D design, textiles and photography) were particularly impressive, the college said. Out of the 250 entries, all subjects achieved a 100 per cent pass rate with 94 per cent of students achieving A* to C grades and 30.4 per cent achieving the top A* grade. 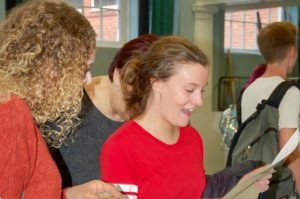 The college also offers a comprehensive programme of A level equivalent vocational courses, which many students take alongside traditional A Levels, and once again it said that these results were equally impressive. Varndean College principal Phil Harland said: “We are extremely proud of the excellent results achieved by our students, particularly in light of the recent changes to A levels which has made them even more challenging than before. “Students and staff have worked extremely hard over the last two years and thoroughly deserve this success. This A level success follows on from Varndean’s second best ever International Baccalaureate results back in July, when 42 IB Diploma students averaged 36.12 points, the equivalent to three A grades at A Level, with 11 students (26 per cent) gaining 40 points or above. Seventy-five per cent of those applying to UCAS have acquired places at Russell Group universities, including two at Oxford and Cambridge and six studying medicine. One student, Samuel Segal (ex Chailey School), gained an incredible maximum score of 45 points, putting him in the top 0.5 per cent of students worldwide, and is now going on to study medicine at Sheffield University. Portia Smith (ex Brighton College) gained 43 points and will be studying medicine at Cambridge and Gemma Robson (ex Patcham High) gained 41 points and will be studying history at Oxford. IB co-ordinator, Emily Board, said: “The International Baccalaureate is certainly a challenge but it produces confident and articulate young people who know a lot about the world around them and can really think for themselves.